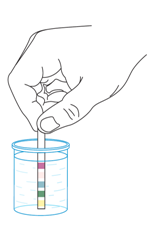 Enzymatic test strips are intended for quick visual semi-quantitative determination of total hardness, pH, nitrites, nitrates and chlorine in water. 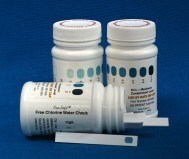 One test strip is intended for testing of single water sample. Highly recommended to test fruits and vegetables washing water, rinse water from production of food industry, for beverages producers (beer, juices, soft drinks, wine, soups, etc. ), tap water, producers and suppliers of RO (reverse osmosis) water, well / borehole water, fish farms, farms and hydroponics cultures, swimming pools, aquariums, etc. 1. Dip the strip into the water sample. All the sensor pads should be submerged. 2. After 2–3 sec., take the strip out and remove excess of water by shaking it off or by careful touch of the strip edge to a clean filter paper (paper tissue). Normal ranges for each parameter are determined by state or local sanitary authorities. *The range limits shown on the color scale are for reference only.